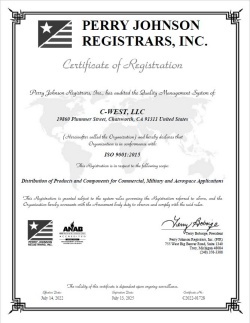 At C-WEST, LLC, we are committed to providing uncompromised quality to our customer partners. We continuously strive to meet and exceed our customers' expectations by adhering to recognized industry quality standards and continually developing our staff. Our Quality Management System is certified to the ISO 9001:2008 standard and complies with all its relevant requirements. • We have a Certified IPC Trainer on staff, who trains our operators to solder to J-STD-001 requirements. • Supply chain management includes a flow-down of all customer requirements through an approved supplier registry. • Rigorous Receiving Inspection System. • In-process and final Inspection criteria that are compliant to IPC standards and customer requirements with the final goal of achieving and exceeding customer expectations for every cable assembly, wire kit and harness that we manufacture. • Calibration system with all calibrations traceable to the National Institute of Standards and Technology (NIST). • We work with our customer partners during prototype development through manufacturability assistance to achieve the highest quality possible in the most efficient way. • Our Quality Management System includes Preventive and Corrective Actions which encompass monitoring for Continual Improvement for added efficiency. Each and every employee is responsible and accountable for delivering high-quality products that meet or exceed our customers'expectations. We seek to continually improve on our products and processes through operational efficiency.